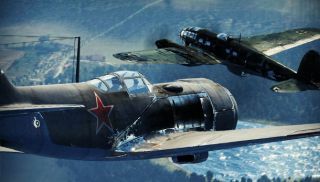 World War 2 combat simulator War Thunder has come a long way since it got Steam Greenlight approval back in February. Russian developer Gaijin Entertainment has released a gorgeous new CGI trailer for the free-to-play MMO, giving us a slow-motion glance at the human side of its incredibly mechanized battlefield of planes, tanks, and naval warships. It's not in-game footage, but the video is a good reminder that a cockpit simulator game like War Thunder only benefits when players get a sense for the story and characters that populate its universe. We see in the trailer a cross section of humanity on both sides of war, from the leather-clad pilot ace to the spittle-spewing German commander shouting orders from the deck of a battleship. It's obvious that War Thunder is a game that wants to communicate the scale of its ambitions, even if you run as a lone wolf and don't look too far beyond the boundaries of your Supermarine Spitfire . War Thunder is free to download on Steam .